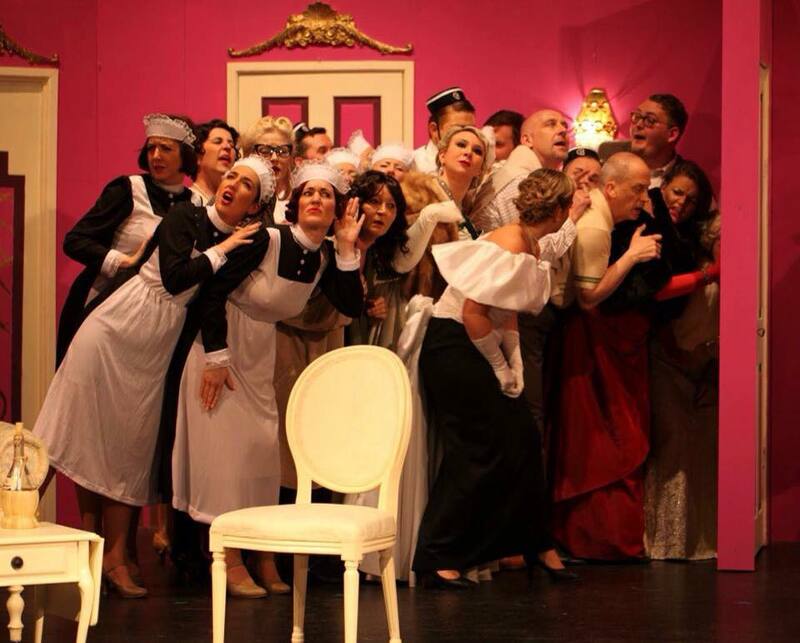 Bromley Players produced this show in April 2015. In order to pull this show off you need to have an ensemble with strong vocals. The cast size is flexible and could range from 15 – 30. 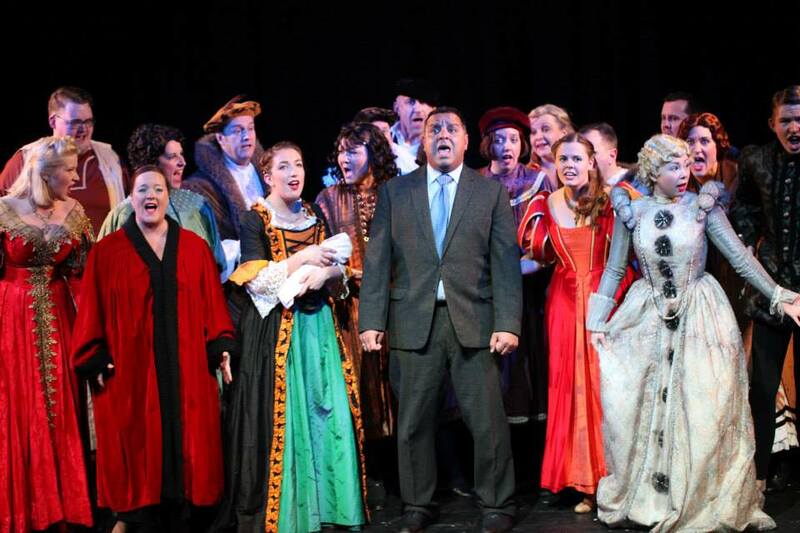 For the leads it goes without saying that you will need strong vocalists however Lend Me A Tenor does ask for something that not many musical theatre companies have – that is an opera singer with great comedy timing. The actress playing Diana needs to be able to sing extracts from many of great opera numbers with a firm tongue in the cheek and be convincing as the star of the opera company. The majority of the show focuses on the 6 leads so the chosen principals must be strong enough to carry the show. In terms of ages this production does has something for all ages, from the young female lead Maggie who has a rough playing age of 16-25, her father, Saunders who has a playing age of 35 – 60 and the ensemble who can be any age as hotel staff and members of the opera company. You will also need some tap dancers within your company as the majority of the dance opportunities within the show are tap. This show requires a very specific set which remains in situ for the majority of the show. That is a typical box set with a dividing door in the centre and 2 doors both sides of the centre door. Due to the story line you cannot go without a set nor is it very flexible. If however you have someone in or linked to the society that is a talented set builder this would be a good project to get them involved in. Period costumes for this show is required. The show is set in the 1930s. Costumes required include a set of maids/bellhops costumes as well as gala costumes and suitable rehearsal attire. The photograph below shows the type of costumes we used for the ‘Othello rehearsal scene.’ It is worth noting that due to the setting of the opera house the costumes should look fairly opulent, which tends to mean that this can work out expensive. This show is fairly straightforward technically. There was only around 6 sound effects and a basic lighting rig with no moving lights should be suitable. Most productions will require a projector for the subtitles during Maria & Tito’s Italian number however if this is not possible you could get round this with large sheets of paper. When looking for a director for this production you need to have someone with a good grasp of farce and understanding of comedy timing as without this the show will fall flat. It would assist greatly if the musical director has some experience in opera and with 2 tap breaks in the show the choreographer needs a strong grounding in tap. One of the big questions……will it sell? I have to admit that Bromley Players approached the show with trepidation. 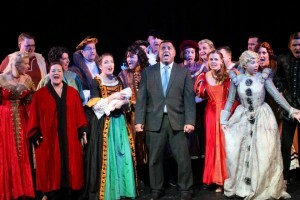 It is a relatively unknown musical and despite rave reviews in the West End it was on for under a year. That being said Bromley Players sold in excess of 90% of tickets. The fact that it was something different seemed to appeal to the audience as did the comedy. If you have a strong marketing department/committee member then this could be a good challenge for you. There is the occasional swear word and a lot of innuendos so it may not be suitable for younger children (although a lot of innuendo will go over their head) however there is nothing offensive within the show or controversial topics that may put some audience members off. This is a great show for a society that wants to take a risk and bring to their audience something they have probably never seen before. It is not a cheap show to do as there is a box set required and period costumes however savings can be made on the lighting and sound.